Years ago when I first started vision improvement, I avoided the eye chart. It felt like a test I couldn’t possibly pass. Without my strong glasses, at 20 feet I couldn’t even see where the chart was! My vision was so strained and contracted back then, I needed to stand no more than a foot and a half away from the chart to be able to make out the top large letter, which people with normal vision could see at 200 feet. The eye chart was not my friend! On the contrary, it felt like a constant reminder of just how blurry and “weak” my vision was. A big step forward in using the eye chart happened for me when I finally realized I didn’t have to have it a full 20 feet away from my eyes. It could be close enough that I could actually read some of the letters! Even though this felt like cheating at first, I propped up a small eye chart to the side of my computer, maybe 3 feet away, which I could glance at often while I was working. Sometimes I’d back my chair up and practice from 5 or 6 feet away. I was starting to soften my negative feelings about this tool that seemed so useful for others. 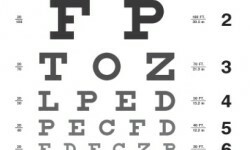 In the past few weeks I’ve decided to be more dedicated about practicng with the eye chart, using it nearly every day. I have to admit I’ve been very haphazard about this until now, and I want to be more regular. To that end, I don’t just want to blindly (!) gaze at the chart and wait for magic to happen, I want to use it to gently exercise my vision in various ways. Following are some of the different practices I’m doing, and I’m coming up with more all the time. Maybe there’s something here you’d like to try too. — Bounce from letter to letter (whether I can make out the letter clearly or not), then from a space between letters to another space. Vary the speed of this. — Examine barely visible letters curiously for details. Does the letter have a corner, or a rounded edge, or a serif (tail) on the end? — With a very small row of letters which looks like chicken-scratch, count letters without even trying to make them out. — Go up to a higher larger row for a brief rest, then back down to look at smaller letters. — Stay with one letter until it gets really clear, or accept some blur and move to another letter right away. How clear is “clear enough” for you today? — Take a short palming break, then return to the chart. — Look up and down the leftmost or rightmost column of letters at the edge of the chart, every next letter a different size, unlike when scanning the chart horizontally. — Vary the distance from the chart, moving my chair back a little farther than I had it last time. — Hold a close small-print chart in my hand, then look from that to the distance chart, then back to the close one. — Alternate sliding around the details of a single letter (tracing) with jumping from letter to letter. — Notice the periphery without putting my central visual focus there. For me the amount of light in back of the chart (coming through the window behind it) makes a big difference in how clearly I see the chart, whether it’s bright sunlight or a cloudy gray day or snow falling, or the curtain is closed because it’s night time. When it’s open, the view out that window is my favorite periphery to notice but not focus on. As others have noted, the eye chart doesn’t lie, and will quickly tell me if I’m relaxed enough to see clearly. I can’t kid myself that I’m calm and centered if my vision is blurry! Following are a few points I need to remember, which are not automatic for me yet. — Stay aware of the periphery. — Enjoy and be grateful for the bouncing of the Universal Swing. As Dr. Bates said, the world moves. Let it move! — Don’t rush — this is not a race! I’ve learned a lot about myself and my habits from the eye chart, and continue to do so. I’m looking forward to the day when I only use it as maintenance for my very clear vision. Right now it still feels like that tough demanding teacher or coach who pushes me to perform better than I had thought possible. Such a simple tool, and so useful! Next Next post: Have I Been A Control Freak?